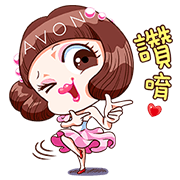 http://www.line-stickers.com/ – AVON Lady: Miss Albee Line Sticker | Friend AVON SHOPs official account to get this set. Available till September 22, 2017. Publisher : AVON COMETICS (TAIWAN) LTD. Copyright : Copyright © AVON COMETICS (TAIWAN) LTD.